Security professionals accept the paradigm of “more protection equals more false positives (FPs)” as a fact of life. The tighter they make the “screws” of the security policies in their DLP, Web or Email Gateways, UEBA, application control/whitelisting and AV tools, the higher the likelihood something benign is misclassified as malicious. That’s why it is not uncommon to see false positive rates exceed 5% using the most aggressive settings. What if we were thinking about this wrong? Can we break this correlation between more security and more FPs? During this webinar we will briefly review the definition of false positives, false negatives, true positives and true negatives, as well as the history of “more protection = more FPs” paradigm. Then we will turn the paradigm on its head and discuss how more protection can actually mean fewer FPs. edgeSuite is a fully secure, system control plane that integrates your applications and data into SPoG (Single Pane of Glass) in a 4D solution. edgeSuite is unique in the marketplace because it incorporates the data within your environment, and the methods used to manage your business to create a single tool for both back-end and front-end solutions. When you are dealing with multiple data sets and multiple data sources, you are faced with the problem of complex navigation of different software solutions, and the inability to access them simultaneously in an efficient and effective way. Come to our webinar and learn how you can optimize your current Micro Focus investments. Seeing is believing! A recent survey conducted by Ensono, in partnership with the Cloud Industry Forum, showed that 89% of respondents believed that legacy technology was a barrier to effective digital transformation. Given that many organisations operate a complex technology landscape often with elements in different locations, and with core components that are regarded as ‘legacy but critical’, there needs to be a clear and simple approach to overcoming these obstacles. Breaking down the barriers requires effective change in people, process and technology to attain a viable level velocity that will enable transformation without being held back by perceptions of legacy issues. Examining these issues, this webinar will provide insight and thought provoking approaches for organisations seeking to transform their operations against this backdrop. IBM Mainframe and IBM i (iSeries-AS/400) environments continue to play a very critical part in today’s corporate IT infrastructures, processing some of the most valued and important data. Learn how one of the world’s largest insurance companies brought their IBM environments into the modern era by extending their Micro Focus Universal Discovery (UD) platform to include the key IBM systems. This Vivit SIG Talk session will feature speakers who will share their vast knowledge and experience on SiteScope and OMi. Vivit is excited to present this informative SIG Talk on these important topics. Web Site Monitoring using SiteScope the WebScript Monitor Tool and a LoadRunner Script: Join us for this presentation of the power of a SiteScope Webscript to monitor your websites in a production environment to provide real time checking on a website including interactions ( login, screen validation, etc). Learn how this will also generate alerts to the OPS team when something is wrong. In this presentation, attendees will learn how these challenges were addressed and ultimately overcome. The management of IT Operations in a dynamic and highly scalable MSP environment can be difficult. With the right partner and strong expertise, you can be helped to lead in the “New”. Join Kulvinder Singh from Accenture as he discusses the deployment of OpsBridge as standard within their MSP Platform. Learn the objectives, scope, methodology, and results of their deployment, as Accenture continues to scale and mature this capability with the increasing number of their clients. Join us for the next upcoming SIG Talk on Tuesday, May 17, 2018: http://www.vivit-worldwide.org/events/EventDetails.aspx?id=1089263&group=. This Vivit SIG Talk session will feature 2 speakers who will share their vast knowledge and experience on SACM Practice and Micro Focus Operations Bridge. Vivit is excited to present this informative SIG Talk on these important topics. Leading The Intelligent Operations with Micro Focus Operations Bridge (OpsBridge): The management of IT Operations in a dynamic and highly scalable MSP environment can be difficult. With the right partner and strong expertise, you can be helped to lead in the “New”. Join Kulvinder Singh from Accenture as he discusses the deployment of OpsBridge as standard within their MSP Platform. Learn the objectives, scope, methodology, and results of their deployment, as Accenture continues to scale and mature this capability with the increasing number of their clients. SMB to Enterprise-level organizations are increasingly using or considering the use of outsourced IT infrastructure providers to remain cost-effectively competitive and productive. But while the rewards may be attractive, there are inherent risks that need to be understood. Getting help to manage your IT Infrastructure can help you to regain focus on your core business. But, before you make that move, make sure you understand all the nuances of your decision. The Hybrid cloud has either been a unicorn (something beautiful but not real) or a boogey man (something to prevent disruption) in our ecosystem for the last several years. In marketing and static architectures, we have seen a lot of promises, but very little actual progress. Hybrid Cloud is becoming more important everyday as nearly all companies are in (or will be in) the public cloud but many of these same companies ‘know’ that they cannot be 100% public. So, the problem we are all trying to solve is how can we provide all the features, functions and automations. Join us for the next upcoming SIG Talk on Thursday, April 19, 2018: http://www.vivit-worldwide.org/events/EventDetails.aspx?id=1081712&group=. 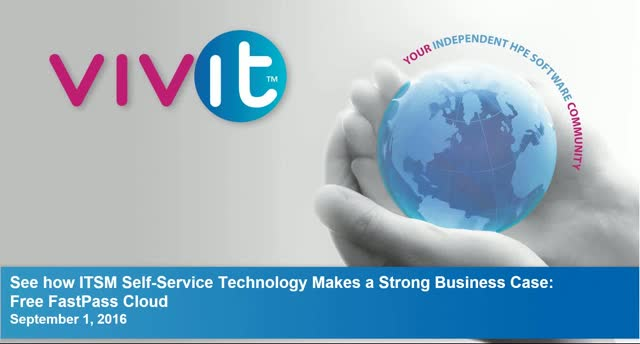 Vivit launches its first ever IT Operation Management (ITOM) SIG Talk event. We have 3 speakers who will give you insights in the ITSMA Containers Concept and migration into the Hybrid Cloud. They will share their knowledge and expertise and provide thought-provoking and actionable content. Everything you need to know about the Micro Focus ITSMA Containers Concept: Containers are here and they are the best way to deploy, maintain and upgrade software. What are containers? How are they deployed? How is the software different on containers than traditional platforms? Why did HPE/Micro Focus decide on a containerization approach to their ITSM suite? Tune in and find out why containers are the deployment method of the future and how to transition your existing ITSM suite from your Linux or Windows environment to a Containerized environment. A “real” migration into the Hybrid Cloud (HCM, PlateSpin, and Cloud Assess): The Hybrid cloud has either been a unicorn (something beautiful but not real) or a boogey man (something to prevent disruption) in our ecosystem for the last several years. In marketing and static architectures, we have seen a lot of promises, but very little actual progress. The Data Centre Maturity Model (DCMM) was created by The Green Grid and can help assess the current and desired states of your data centre(s), highlighting areas that could be enhanced using a maturity modeling approach. *Please note: this webinar will be presented in Dutch. This webinar covers the various legislation and policies, at a European level as well as their application in four different countries, namely: United Kingdom, Netherlands, Germany and France. Legislation and Policies have an important role to play to steer, stimulate and support new products and services but also new business models. *Please note: this webinar will be presented in French. Listen to Sophie Legault, Director of T&D Business Unit at EXFO as she talks about the 4G to 5G transition, the implication of highly dense networks, impact on the costs of maintenance on fronthaul networks and the challenges MNOs may face. She will also delve into best practices for addressing interference and PIM in mobile networks and improving the quality of fiber-based fronthaul and CRAN deployments.